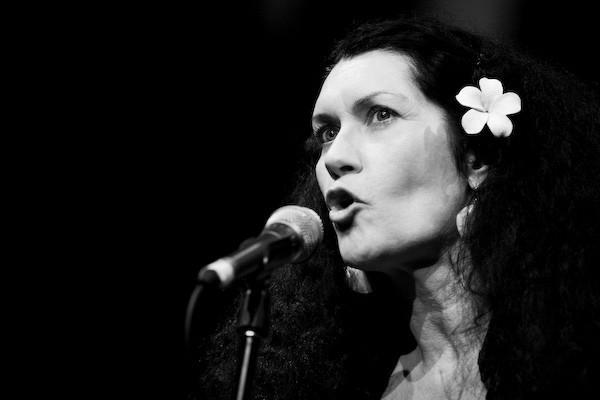 At the beginning of this year, Serie Barford was one of the amazing Pasifika poets who performed at the Stars of Pasifika Poetry event which was held at the Auckland City Library. I had the pleasure of attending that event and it was there that I got to see her perform live for the first time. She was truly inspirational! She is a writer that has had her poems and short stories published in journals and anthologies, among them are Whetu Moana, Niu Voices, Landfall, Poetry New Zealand, Dreadlocks, Writing the Pacific, Trout, Blackmail Press, Snorkel and Best New Zealand Poems. I have one of her collections of poetry which was published by Huia entitled Tapa Talk and I highly recommend it (click HERE to purchase the book). It is with great pleasure that I share with you Serie Barford’s sentiments about her poetry work. My mother identifies as German-Samoan and emigrated to Aotearoa in the 1950s, my father is Palagi and I was born in Aotearoa and I was a child in West Auckland when it had gravel roads and no one even thought of locking their doors at night and man had yet to land on the moon. I was delighted to receive an invitation from Maryanne to share some thoughts about my poetry on her blog. It got me thinking about how the whole poetry scene has changed since the early 1980s, when I was first introduced to public poetry readings at the Globe Tavern. That’s where I met or listened to other poets of Maori and Polynesian descent such as John Pule, David Eggleton, Albert Livingston Reffiti, Michael O’Leary, Hone Tuwhare, Apirana Taylor and Haere Williams. The Dawn Raids and the Springbok Tour were fresh in our minds. I remember reading ‘Plea to the Spanish Lady’, the title poem of my first poetry collection (Plea to the Spanish Lady: Hard Echo Press: 1985) to a disbelieving Globe audience. Spanish influenza followed soldiers home after World War One and was personified as the Spanish Lady. New Zealand administered Western Samoa at the time and completely bungled any attempts to quarantine or treat the ill.
“What do ya mean New Zealand was responsible for the deaths of 22 per cent of Western Samoa’s population?” the audience heckled. “Never heard of Colonel Logan….. You’re pushing poetic license too far girl! 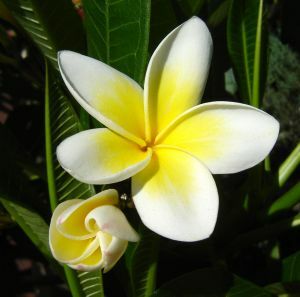 …Who dies from the flu?” There are mass graves in Samoa as well as in Waikumete Cemetery in Auckland where the victims of this devastating flu were shovelled. are going to die. Let them die and go to hell.’……. That same night Apirana Taylor read ‘Sad Joke on a Marae’. Many of the audience seemed pretty stunned by the themes in our poems. Others were fully aware of how lives and stories exist in the ‘between spaces’ of dominant narratives in colonised lands. It’s still like this….. In 1984 we were reading poetry against the backdrop of ‘The Kia Ora Controversy’. This was when Naida Glavish, a tolls (telephone) operator began greeting callers with ‘Kia ora’. Her supervisor insisted that she use formal English greetings. She refused and lost her job. The debate was fierce, the Prime Minister intervened and some poets stood in the spotlight and deliberately prefaced poems with Kia ora. I was consciously shaping verse from a ‘working class-mixed marriage’ background. ‘Covering Exercise Books’ from my second collection Glass Canisters (Hard Echo Press: 1989) examines the distance between the home/parents and the school/child when a teacher asks the class to cover their exercise books. The child wants everything shiny and new and wants to please the teacher who is the new fountain of knowledge in his life, but his parents carefully and lovingly iron old brown paper and cover his books with pictures of asparagus they cut out of a magazine while he was asleep. so her son would look special……. In between Glass Canisters and my third poetry collection (Tapa Talk, Huia: 2007) I’d worked as a secondary school teacher, had a child, got married, had another child, divorced, returned to the family home to live in a four generation household, moved out, had some disastrous experiences which culminated in a breakdown, was reunited with a man I’d met in Samoa in 1982, had moved into community work and was also living between Aotearoa and Kanaky (New Caledonia and the Loyalty Islands). I’d hardly had time to breathe – let alone write for years and a new generation of poets who were influenced by technology and a post man-on-the-moon world were on the stage. 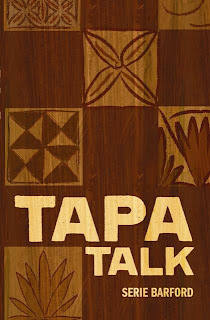 Tapa Talk was inspired by my time in various locations on the mainland and islands around Kanaky. I decided to explore the universe via the concept of teu le va – the relationship between distances, places and people in the visible and invisible worlds. ‘Connections’ is written in seven parts with the Biblical creation story and the suppression of siapo (tapa) motifs which were associated with the Samoan creation story in mind. I was fascinated by the endurance of the symbolic language of tapa and how it was being adapted to link the old and new worlds of Pacific nation people. in the seen and unseen worlds …. the land, the sea and the sky are in accord…..
‘Culture Shock’ explores my entry into the New Zealand university system. I was brought up the old way within the church and with chaperones and found myself alone in a strange place at the height of the feminist movement in the late 1970’s. Every time I opened my mouth in a tutorial I felt like I was being mocked and that my world view was being ridiculed. It was a terrible time. When I graduated I was offered the chance to do a Masters degree but couldn’t wait to escape. Once my parents had the graduation family portrait on the wall I got out and went wild for a few years. I felt like I didn’t belong anywhere and that I was surrounded by conditional love. ‘Be a good girl and you’ll be loved.’ The definition of ‘good’ was strangling and suppressing me, but at the same time I didn’t want to hurt the people I loved. I’ve since resigned myself to the fact that I live in the margins and that’s okay because I can create from this space and it’s my ‘inner world’ that keeps me anchored to the ‘outer world’. Tapa Talk is full or connections and disconnections and transformations and it’s a portrait of my life at that time. but today all is well…..
I’m in another chapter of my life at the moment. I’m deliberately giving voice to the silences between spaces and places and people – the voids that are full of potential. I’m writing short stories that are really poems with the words running into each other. Fa’afetai tele lava Maryanne for giving me the chance to include some of my thoughts in your blog. Serie, thank you so much for sharing. I really enjoyed it! Many thanks for providing your feedback for Serie. I appreciate it. She is amazing! What is shared is so very richly inspiring!!!! Many thanks for stopping by brother! Serie’s story takes us on a wonderful journey. She is an inspiration! thanks for this powerful, moving post. Many thanks for reading and for providing feedback. Serie is an inspiration indeed. I was quite sleepy, but gathered pillows on my bed and thinking ‘MUST READ’ in the darkness and stillness and light of my magic machine, I half cried, half smiled lots arrhd and awed. Absolutely interesting journey, MAGIC. Nga mihi na Georgie. That is wonderful feedback. Thank you for taking the time to read Serie’s post and share your moving words with us. Serie’s journey is inspirational! I really enjoy Serie’s poetry and the way she doesn’t shy away from politics. Thanks for sharing this! I absolutely agree with you there and I am so honoured to have had Serie share her inspirational journey with us all. Many thanks for stopping by. SO BEAUTIFUL AND AMAZING! Thank you Maryanne and Serie! You are both inspirations and world leaders to me. Sending so much LOVE from NYC and I can’t wait to meet both of you!